Another Friday night spent playing with sugarpaste. 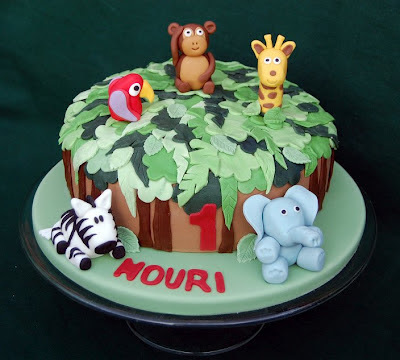 This time I was working on a jungle cake for a first birthday. Now I know that some of these animals are actually found in savannah grasslands and not in jungles, and I must admit that this did bother me a little, but I decided that a little artistic licence was in order to achieve the best results. This cake look great! A lovely idea for a first birthday. How did you get your stripes on the zebra and spots on the giraffe? Hi Laura. Thanks for the lovely comment. The spots and stripes are cut from sugarpaste. A bit fiddly!